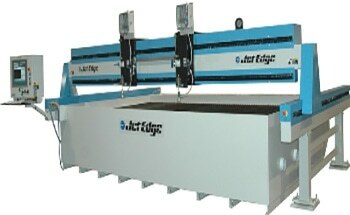 The High Rail Gantry Waterjet System from Jet Edge can create intricate components from almost any material. 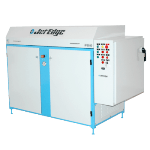 The system has an overhead design, allowing the work envelope to be accessed fully and the critical components to be raised out of the water jet process environment. 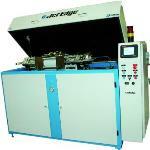 Any Jet Edge waterjet pump can power the system. 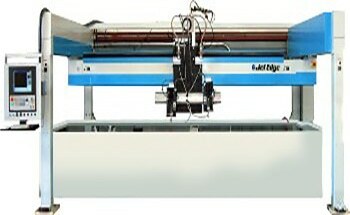 The High Rail Gantry Waterjet System features a stress-relieved steel-fabricated frame for superior rigidity. Rigid honeycombed steel beams provide a stable and rapid operation, and the system can support multiple cutting heads. Moving components are supported on THK linear ways and servomotors are directly coupled with precision ball screws. A lip seal system provides complete protection to XY mechanical components from the abrasivejet environment. Key motion components are protected through the use of brushes, lip seals, labyrinth passages, and high-volume low-pressure filtered air. Tthe service life of the system is much longer than traditional bellows arrangements. It is also possible to expand the system to meet business growth. 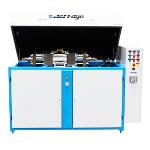 The most sophisticated waterjet motion controller of the industry, the Aquavision® Di Controller allows the user to generate part programs offline and transfer them easily to the hard drive of the system for production. 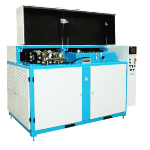 It is completely networkable, and the customized front end directs the user throughout the process, starting from job set-up to production. 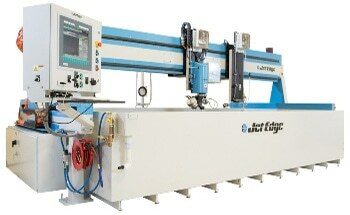 Rotation, mirroring, plate alignment, single parts, and part arrays (optional) are available with the click of a button.